The program contains the following games: - 301/501 singe out, double out, Master out, double in - Cricket, “normal”, Master, Cut Throat - Shanghai - Round the Board single/double - 301 Elimination - Highscore - Splitscore - Las Vegas - Bobs27 Also trainings for different segments or double fields, checkout training, special trainings and the possibility to create your own trainings. You can also play against the computer or your own best game. The possible unique feature of the program is that you not only can mark your hits with the mouse, but as well (if you like to do so) your aims. This allows very interesting analysis. 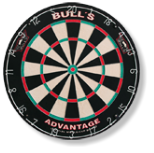 But even with you can get interesting statistics about your game play or just have fun playing the darts without the need for write down the scores. You can access detailed statistics of your games and also take a look at the visual hits, both can be exported or printed. You can find a more detailed information on the download site in form of a PDF which is also included in the program. If you miss a game or have an interesting training just let me know. The program is still in development. The program searches automatically for new updates if you like. One of the next features will be the possibility to play against other players on-line and a team player mode.